Wow. Reading the first issue of The Star Wars really makes you think about how much an original script can change once Hollywood’s got its hands on it. The book isn’t shy about how different it is either. Even before making your purchase it hits you with the cover line “Longer ago, in a galaxy further away”; if a comic has its own clever disclaimer on the cover, you should know that you’re in for a bumpy ride. Thank you, to whoever decided to not make this into a movie. That being said, The Star Wars is a pretty decent sci-fi comic; I would in fact rate it much higher if it did not have the “Star Wars” name attributed to it. The story of The Star Wars has no rebel alliance, no Vader helmet, and no R2-D2 or C3PO (so far). Instead, it takes many small plot points of the original films and reveals how important (and cluttered) they were in Lucas’ original vision. You didn’t have to do it that way… changing everything in every way. After my initial reading of the issue, I still find myself trying to understand Lucas’s original vision. 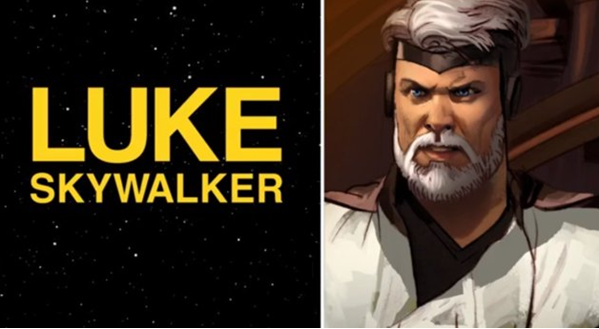 Annikin Starmullet (Starkiller) is obviously going to be the hero, and Luke Skywalker is going to be his Jedi Master… How messed up is that right? Where is Ben Kenobi? Is Ben Darth Vader? Prepare to ask yourself questions like this and much more. Annikin Starmullet with his traditional RED Jedi light saber. 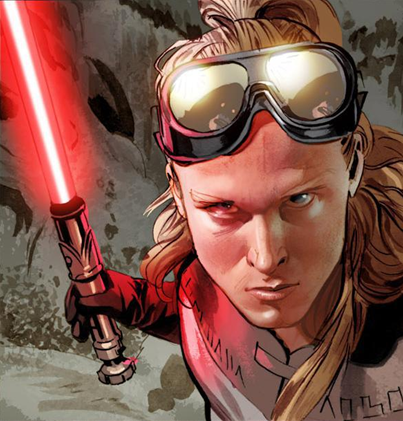 If you’re a Star Wars fan, you’ll find yourself as confused and perplexed as I am when reading The Star Wars #1, and that is exactly why this book is a MUST BUY. Unlike the extended universes in other media, this book is legit people. 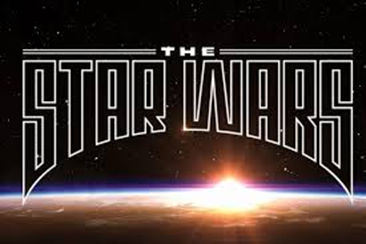 The fact is that we’re finally being given a brand new Star Wars story, from the mind of Mr. Star Wars. When reading this comic please try to forget the lofty standards set by the original trilogy and try to enjoy this Star Wars… The Star Wars, because this is the Star Wars that was originally thought up in the crazy mind of its creator, George Lucas. The characters, words, and setting are fantastic, because they are pure displays of one man’s imagination. They’re the napkin scribbles, the daydreams, the nightmares, and the notes. The Star Wars isn’t perfect, because it was never meant to be. The Star Wars is a showcase of George Lucas’ mind, and should only be treated as such. If you’re even slightly interested in what exactly was going on in Mr. Star Wars’ head, pick up The Star Wars #1 and take a look. I’m not saying that Luke looks like a Level 80 Cleric… but he totally does. For more reviews from Franco Romualdez please click HERE. This entry was posted in Comic Book, Comic Book Reviews, Dark Horse Comics, Franco Romualdez, Geroge Lucas, J.W Rinzler, Mike Mayhew, review, small press, Star Wars, the star wars and tagged comic book reviews, dark horse comics, Franco Romualdez, Geroge Lucas, J.W Rinzler, Mike Mayhew, review, small press, star wars, the star wars. Bookmark the permalink. Personally, I liked THE STAR WARS very much. I love the internal intrigue that I felt building as the book shattered preconceived notion after preconceived notion…even though I knew exactly what I was getting into (sorta). I’m in for the long haul on this mini. I’ve been waiting for a couple of decades to see this draft’s details unfold. I think you’re totally right to point out the highlight of this title is not the story on its own merits (take it or leave it) but more as a historical artifact that gives some insight into the Mysterious Mind of Lucas. It’s a cool way to see what was originally important to Lucas in this universe as well as how the story evolved into what we eventually saw in A New Hope. Thanks for agreeing with me man! I really wouldn’t mind if the release of original scripts in comic form becomes a trend (I might regret saying that later, haha).